For a while it looked like the Asahiyama Zoo would have to close its doors due to plummeting visitor counts. But then the zoo experienced a rebirth, and the number of visitors has skyrocketed. The zoo is in the city of Asahikawa (population 360,000), close to the center of Hokkaido at 43 degrees 46 minutes north latitude, making it the northernmost zoo in Japan. So what magic turned this municipal zoo into a magnet for people from throughout Japan and the world? King penguins march so close that their admirers could touch them. Red lines in the snow mark the sides of the route they follow in the zoo. Visitors are asked not to cross the lines, to avoid frightening the penguins. The march occurs only when there is snow on the ground in winter. "Wow, are they ever cute!" and "Hey, they're on parade!" are two things you will hear from the excited crowd on the packed snow. People crowd in from both sides of the road while king penguins shuffle past in a long line, sometimes flopping down in the snow, but then picking themselves up to continue slogging along. 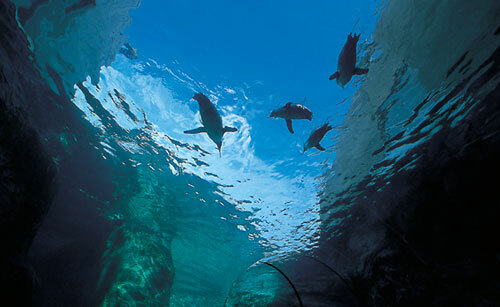 Visitors and penguins are close to each other, with no fence or rope separating them. 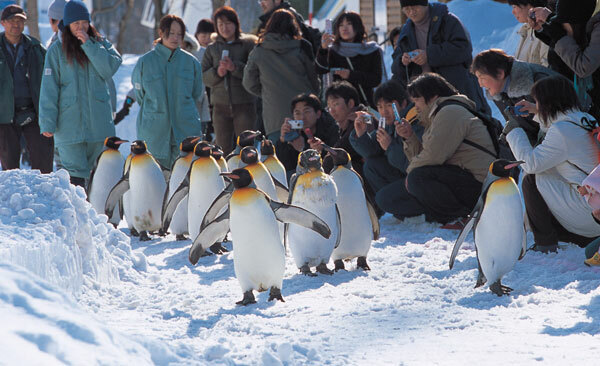 This is the winter march of the penguins at Asahiyama Zoo. Their shuffle is so surprisingly parade-like, the first time you see them you might think they were trained to march like that. But no, king penguins interact with one another in large groups, and they walk long distances together to feeding grounds. Apparently, the zoo started the custom of letting them march in order to keep them active in winter. This is one of the "wildlife show times" that have set Asahiyama Zoo apart from other zoos. The animals put themselves on show, behaving as they would in the wild.